For the body, Rob prefers fine gold tinsel with a fine gold wire rib. For a weighted streamer, he suggests spiraling .015 lead wire over the front half of the shank, leaving about two hook-eye widths for the head. Orange is a great attractor color, but red or yellow are also good choices for tail and collar color. Further variations can be made with dyed woodchuck fur, such as red, yellow or olive, or by using colored wire for the rib. 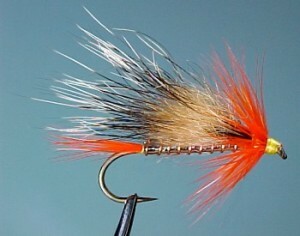 Step-by-step photos and complete tying instructions can be found on the "My Favorite Flies" page. Mission Objective: capture and detain photographs of bass and/or trout caught on Peter Frailey's "Woodchuck Special". I'm still new to photographing caught fish with my new digital. This in itself is an adventure. I went to Rock Creek, one of my favorite places, to try for the photos. The plan was to hit the slower runs of the lower section to get the bass in the morning, then run upstream to the riffles and pocket water for trout. Hurricane or Tropical Storm Lily or whatever it was pushed some bad storms up this way, so I ended up leaving late after the weather cleared a bit. Got there just before noon, but I figured I could comb the deeper pools for the bass, even with the sun high. I started at White Oak Junction, where the creek "disappears" into an underground cavern. There's a deep pool there, and slow, lazy riffles just upstream of that. Got a few follows by some average-size bass, and one hearty grab that I didn't get the hook-up on. I snuck upstream through the woods then cast downstream into the riffles to a "bass" I saw holding on the far side. A slight swing and a couple of strips brought the fish out to slam the Woodchuck Special. I lifted to set the hook and a foot-long flash of silver launched into an aerial somersault. Silver? Yup. Rainbow trout. I hadn't thought the procedure through, so in fiddling with my camera, and trying to keep the fish in water without excessive force, the trout snuck free, and I didn't get the shot. From there I worked my way upstream, fished the slow runs for bass (which I never got a hook-up on, but had some BIG smallies or Kentucky bass follow it in) and the riffles and such for trout. There's a pool that's about 25 feet long and 20 wide, which is fed by one waterfall, then empties via another little waterfall. The water is "choppy" with the current flowing over submerged boulders and big tree trunks (yes...snag country), so you can't see if there are any holding fish, but it looked real "trouty." I cast right to the lip of the downstream waterfall, then immediately stripped the Woodchuck Special so it ran about 6 inches under the surface. 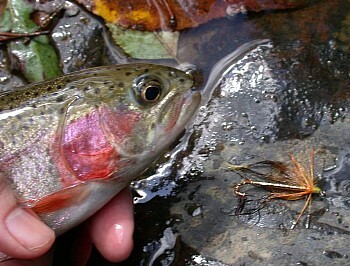 Sure enough, a scrappy little rainbow emerged from the dark bottom to take the fly. Having an action plan and keeping my cool, I did manage to get a photo of that one. I thought this fish was a bass, too. One of a pair I spooked as I work my way downstream through some "skinny" water. It didn't flee far, so I made the cast and the hook-up, soon realizing it was another trout as it skipped and hopped in and out of the shallow run. Got the trout to hand and as I grabbed it, it broke the fly off the line, still hooked. In the wiggling, it slipped from my hand and threatened to make off with the fly. So without a touch of grace I managed to nab it again. I removed the fly, finding that the little fellow had severed the gold wire and pushed it down into the bend. No time to fix, so I laid the fly on a rock and held the fish near for the photo. The result...good photo, with a beat-up looking fly! So I didn't get much in the way of photographs, but my day with the Woodchuck Special was nonetheless rewarding. I tied on one fly and left it there all day (a rare occurrence for me!). Good fishing, beautiful scenery, adventure, and I met another fly fisher with whom I talked for an hour and a half who was also taking advantage of the trout and admired the streamer I had (this fly catches fishermen, too!). The Woodchuck Special has worked itself into the upper echelon... a permanent position in my streamer wallet, a place reserved for the most effective patterns I wouldn't want to leave behind. It's beautiful in the water, the orange complimenting the woodchuck nicely, and the nervous jitter of the guard hairs spaced by the underfur. A marvelous creation!